GWA takes a customized approach to tuition, considering a family's unique financial situation. 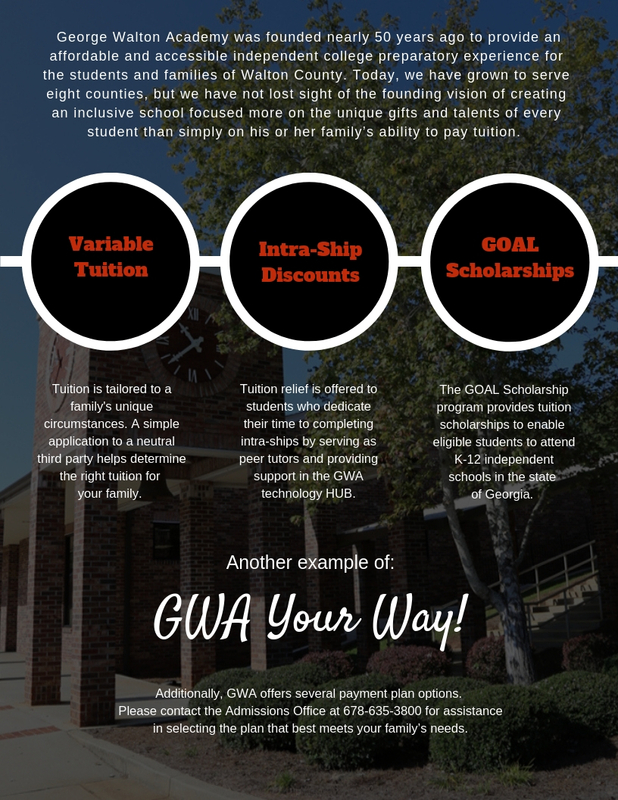 There’s no specific income that automatically qualifies a family for reduced tuition at GWA, as income is only one factor considered during the determination process. Other factors include but are not limited to, family size, number of children and family assets. The Academy partners with FAST - an advisory company that provides a need-based financial aid analysis, including a recommendation of the amount that each family can reasonably contribute toward tuition. The distribution of FAST awards is based on student need, academic and non-financial contributions of the student and his or her family, and the availability of space and funding. GWA offers tuition relief to students who complete intra-ships by serving as peer tutors and providing technology support in the HUB. If interested in applying for one of these intra-ships, please contact Director of Admissions, Cari Bailey at cbailey@gwa.com. Available to students who are new to GWA and were previously enrolled in a Georgia public school, the Georgia GOAL Scholarship Program provides tuition scholarship awards on the basis of financial need. When applying to a participating school for receipt of a GOAL scholarship, families must provide proof of eligibility. For more information visit the eligibility page on the Georgia GOAL website. These merit-based scholarships are awarded to high-achieving students who are entering GWA in middle or upper school and who demonstrate excellence in academic, leadership or arts pursuits. The oldest child will be considered the first child. There is no discount for a K4 student. Annual: Entire balance is due March 1. Semi-Annual: Equal payments of 50% due March 1 and August 1. Monthly: 12 equal payments beginning March 1 with last payment due February 1. Please note that administrative fees apply to some payment plans. Bus service charges are due monthly. Please check with our front office for the most recent bus route information. Bus fees are capped at $250/month per family. Bus service fees are payable September through May, and bus costs may be adjusted throughout the year due to increased gas prices. Hot, nutritious meals are served each day in the GWA cafeteria. The cafeteria is managed by SAGE Dining Services. SAGE cooks meals from scratch, using fresh, wholesome ingredients. SAGE does not serve peanuts, tree nuts or nut oils to school-age children, nor are nut oils used in the cooking process. Students enrolled in K4 through sixth grade are eligible for the GWA afterschool program. The afterschool program registration fee is $25 per family. A late fee of $1 for every minute will be assessed for all students picked up after 6 p.m.
For questions regarding GWA tuition, fees, payment options and additional services, please contact Director of Admissions Cari Bailey.